Life is not a competition, despite what we may believe or hear. I'm not better than anyone else and I certainly don't have it altogether. Most days are good but they're not all filled to the brim with joy, I struggle and I cry, I doubt myself far too often! It really is easy to let our thoughts take over as the comparison game whittles away robbing happiness and joy from our lives. I'm guilty of this on more counts than I'd like to admit. We become conditioned to the lies that circulate that we will be happy if we had somebody else's life, that thing (house, car, finances) or Insta-Blogging success should be our successes too! The reality is, it's just a lie! 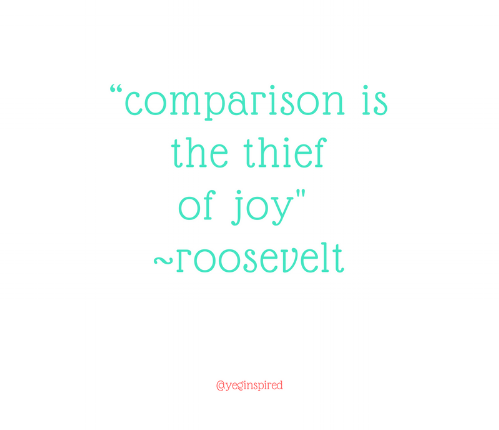 While I was writing this post, I began to see how many different ways comparison has robbed me in different ways & it's not always what I thought, sometimes it sneaks in unexpectedly. We rob our joy when we compare, generations before us. We fall for the idea that they had it easier or better. Yes, life was simpler but not always. Our grandparents, fought in wars, may have survived through the Depression, enduring hardships of their own. My own parents lost a home, turning it back over to the bank when it was time to renew a mortgage in the 80's when faced with a 21% mortgage rate, making me appreciate the rates we enjoy today. We rob our joy when we compare our children against our own children. How often have we pitted child against child.. or even our childhood to our children's present lives? We had it better, we had it worse.. when do we see that our life then and now are just different. Maybe it's not better or worse.. maybe it just is what it is? When do we appreciate our children for who they are and celebrate their own individual qualities and experiences that are available to them today? And why do we compare our children, one vs the other? Do they have to be better than their siblings? Do they have to match intellect and talents when they may excel in other areas that should be equally celebrated? We rob our joy when we compare our friends experience to ours.. dare I say undermine their experiences to ours? As a woman, we compare pregnancies and birthing stories, and sometimes it becomes a one-up game, scoring points for whoever had the most traumatic delivery. In the end, we rob our friendships by diminishing another mama's experience by elevating our own. Comparison robs us of having a listening ear and deeper friendships. We rob ourselves of joy when we compare our marriage, our education, our emotions, our friendships, our hobbies and careers to others. Can we do things to our betterment? Absolutely, change and improve areas, exercise, take a course, do what you love, seek help where it's needed. But if you're feeling hindered because you're stuck in the land of comparison, take a pause to see why you think it is better? Is there life better.. or have we assumed it is? It's my personal belief, having been on the receiving end, that we don't know what's behind closed doors. We all have stuff, or walls up that are trying to protect us from hurts that we are working thru. Comparison, however, can blind us from seeing the reality of a situation. At a retreat many years ago, on the very first night as the speaker shared her life story, I began to break down while I sat there listening to her, tears streaming down my face. The speaker knew exactly what I had been thru, she knew the trauma I had survived, it was as if she was solely speaking to me. At one point during the weekend, a lady that I didn't know all that well from church approached me to say, she was shocked to see me crying, assuming I had a perfect life because of the way I dressed because I was always smiling or laughing. From her viewpoint, it seemed like life was perfect for me, what she didn't know along with many others, was that I had been sexually assaulted by a relative in my teen years and struggled for years with nightmares. She didn't know that I would get triggered by certain smells in situations that caused my stomach to recoil and my need to retreat. While, it took time and counselling, not many people even in my own family were aware, keeping the secret and feeling shame for years! KICK COMPARISON TO THE CURB! Whether it's comparison nipping at us as we hear about a friend going on adventures, the well-known Influencer getting a ton of products or perks, or our neighbours living their best life, don't assume it is. They may be facing unknown depression, a family illness or personal battles beyond what is public knowledge. When envy makes an attempt to rear its head, consider the opposite reaction encourage or congratulate them, extend them grace and kindness..even if words fail internally you can think a happy thought for them, giving room for joy and kick comparison to the curb.